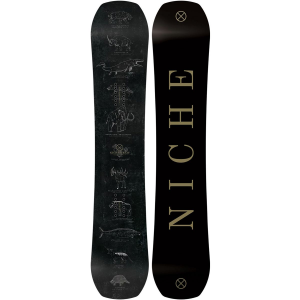 Flat is the theme of 2016 snowboards and nobody does it better than Niche on the 2016 Niche Knew snowboard. Sometimes when you hop on a flat snowboard it can feel lifeless, but if it’s done correctly it can have tons of pop and life. The 2016 Niche Knew snowboard pulls together all of Niche’s eco-friendly technology to pull off just that. We found it to be poppy, stable, and a great all-mtn/freestyle board. It handled the park with ease. Although not a soft jibby noodle, it was still able to wrap around the rails when needed. It launched great as long as you put some ollie pop into it. But as Javi said, landing bolts (squarely on on your feet) can make some big landings to flat feel a bit extra heavy. In all if you’re thinking of getting a flat snowboard this season (and they’re hard to avoid) consider the Niche Knew. The award-winning Knew is the perfect flat camber twin, with the pop and stability needed to hit jumps, rails and anything else the mountain might throw at you. The poplar core and HempHop™ stringers provide plenty of pop and stability, while the flat camber and soft flex are perfect for pressing rails. With a centered stance on this true twin shape, you’ll be hard-pressed to find another ‘jib board’ as versatile as this.